Lake Santeetlah View Home for Sale. Vacation rental potential. Robbinsville, Graham County NC. Santeelah, Santeela, santeetla. Lake Santeetlah NC Lake and Mountain View Homes close to boat ramp and marina for Sale. Robbinsville North Carolina Mountain and lake view homes, cabins near or on Lake Santeetlah and Fontana Lake for sale. Western North Carolina Mountain homes for sale. 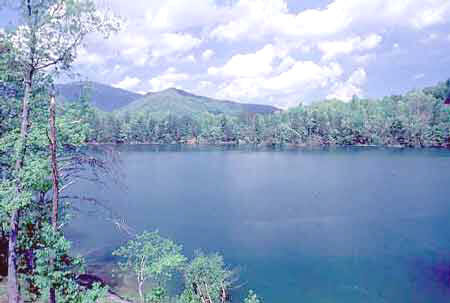 Lakefront log homes, cabins, waterfront homes, lake front homes, lakeside house, river homes, gated community golf course development homes in the NC Smoky Mountains. Robbinsville, Graham County log homes, creek front houses, trout stream cabins, weekend vacation homes for sale in the NC Smoky, Smokey, Smokies Mountains. Santeetla, Santeela. Lake Santeetlah View Home for Sale. Vacation rental potential. Good Investment Property - Two-story lake view home with 3BR/3BA and additional building lot located in upscale community on Lake Santeetlah. Complete living quarters on each level. Property has good vacation rental potential.